We’ve published a couple of alternate histories already, including a great one in which Andrew Sullivan imagined a world in which 9/11 had never happened. So it was not a huge leap for me to suggest a story in which Gore had become president. New York’s editors have a brief meeting most mornings to go over fresh ideas, and when I offered this one, Adam was enthusiastic, and said that I should come up with a plan to assign the story. I pretty quickly realized that fiction writers, rather than reporters, would be the people we’d want to call in, and I thought I would start by checking in with Kurt Andersen, who (a) is a contributing editor at the magazine, (b) wrote Turn of the Century, a 1999 novel set in the then-near future that has the kind of satirical tone this story would call for, and (c) is as smart about politics and culture as anyone I can think of. Adam agreed, as did our editorial director, Jared Hohlt, so I e-mailed Kurt right away. He was enthusiastic about the idea but at first begged off, citing a book deadline he had coming up. 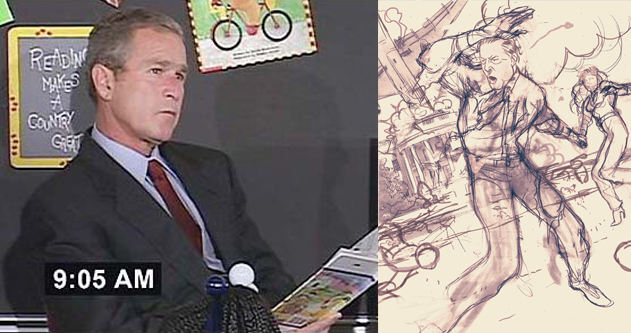 Actual 2001, as George Bush prepares to read after being told a second plane had hit the WTC; Tomer Hanuka's sketch of Kurt Andersen's Alternate 2001, in which President Gore escapes the destruction of the White House. I forget exactly when, but early in this process we discussed whether to assign the story to one writer or several, and we decided on the latter. 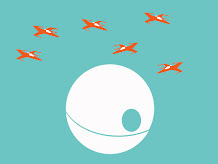 A group of authors, rather than a singleton, had the potential to make the story more fun. In particular, it would get multiple political viewpoints into play. From there, I thought of an exquisite corpse--the old-fashioned form in which one writer contributes a chapter, hands off to another who does the next one, hands off to still another, and on and on. That turned out to be true. I was, after all, contacting well-known, well-regarded authors, and they get many such requests. Virtually everyone was enthusiastic; the typical response was “I am very eager to read this, and wish I could do it, but I’m already behind on a deadline for...” But there were encouraging yeses early on, too. Some writers I thought of and approached in that first wave, like the novelist Kevin Baker, signed on quickly. Other names occurred to me over time. A few weeks in, my colleague David Haskell said “Hey, what about Walter Kirn?” and I all but ran back to my desk to e-mail him, because he is a writer I deeply admire. I also approached someone who spent several professional years creating stories like this: the political commentator Lawrence O’Donnell, who wrote for The West Wing. Unfortunately for us, he was right in the middle of launching his MSNBC show, and had to decline. 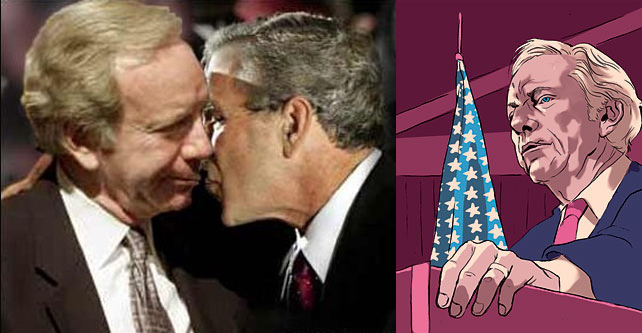 Actual Joe Lieberman being kissed by G. W. Bush; alternate Lieberman betraying Gore, in Kevin Baker's version of 2002-3. Kurt Andersen also said he could make time to do one segment, and (because of his long history with the magazine) I thought he should anchor the story and establish its tone. So I suggested that he split his contribution in half, and write the first and last chapters, 2001 and 2010. He agreed, and started work on 2001. Everyone was to shoot for 1,000 words, giving us 5,000 words total—typical of a longish New York feature. I was a little concerned that the story would end up one-sided: pro-Gore, anti-Bush. Most novelists tend toward the lefty side of the spectrum, and two of our contributors were to be Kevin Baker and Jane Smiley, who both have strong liberal voices. So I started mulling over who would provide a good counterpoint, and as I was compiling a shortlist, I noticed that the Sunday Times best-seller list contained Glenn Beck’s novel The Christmas Sweater. Another lightbulb went on. I called his PR team at Fox News the next day, which in turn put me in touch with Team Beck, and within a couple of days I got back word that Glenn was in. That made me especially happy--readers on both left and right were now likely to encounter at least one chapter with which they’d disagree. It also meant that Beck would probably follow a liberal writer, and perhaps would try to change the direction of the plot, and that whoever followed him might try to bend the story back in another direction. That, I hoped, would be entertaining to read. The "Mission Accomplished," moment, when George Bush was the first American President in history to wear a military uniform while in office; Tomer Hanuka's sketch of Glenn Beck's imagined alternate faux pas, in which Gore inadvertently eats a polar-bear steak. The basic idea for the ending came from the boss. After he'd read the early chapters, Adam said to me that it might be fun to have the story circle around to right now—in other words, that nothing would end up different about the present day. He asked me to offer Kurt the idea; I did, and he liked it. It also led to one of my favorite details in the story. 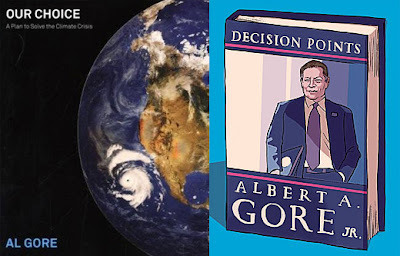 In Kurt's closing scene, Gore goes on TV to promote his book, Decision Points, which has the same title as the book George W. Bush was plugging last December. The matching book tours took me by surprise in Kurt's draft, and I laughed out loud. I’m pleased to say that, once all the writers were lined up, this was one of the lighter pencil-edits I’ve ever had to do. All five contributors delivered manuscripts that worked. Jane Smiley’s initial draft took one turn that I found a little hard to follow--a sequence that, if read a certain way, could appear to contradict several plot points from earlier chapters--but she cooked up a tidy solution very quickly, for which I was grateful. Nobody’s copy needed heavy work; my chief editorial task was just snipping and trimming, because nearly everyone went a little bit long, and the story had crept up to nearly 8,000 words altogether. That seemed heavy, given that this was supposed to be a little bit of a lark. I made lots of small cuts; our managing editor, Ann Clarke, found me one extra page of space; and if I remember right, we ended up at about 6,800 words. I’ll also say that, as the first reader of each chapter, I enjoyed myself immensely. Kurt had a terrorist blow up the White House in Chapter 1, and that established a certain anything-goes tone for the others, all of whom rose to the occasion. As each chapter arrived, it made me a little happier about the project. 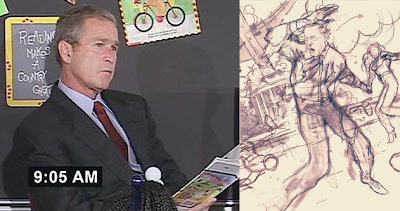 GW Bush narrowly dodges a shoe thrown by an irate Iraqi journalist. Tomer Hanuka's sketch of Jane Smiley's version of a 2006 assassination attempt against President Alt Gore. The illustrations were lots of fun. Chris Dixon, who is the magazine’s design director, and Jennifer Miller, its photo director, discussed two chief possibilities with us: ultra-realistic photo-illustrations, in which we’d insert Gore into key moments from those eight years using Photoshop, or comic-book images, which would play up the satirical aspects of the story. We went with the latter approach, because it better matched the over-the-top tone of the writing, and you can see Tomer Hanuka's excellent works on this page. Initially, we’d discussed running the story during election week, but several things intervened. Because the chapters had to be written consecutively, and each writer needed a couple of weeks, the entire thing took months, and stretched into late October, so we were going to be down to the wire. There was also plenty of contemporary political material going into the magazine those weeks--stuff about the midterms, mostly--and we were concerned about piling up too much at once. Then, in a scheduling meeting, someone pointed out that Bush v. Gore hadn’t played out until December, and that in a pinch, the story could run as late as Inauguration Day. In the end, we lined it up with the tenth anniversary of the end of the Supreme Court’s decision to end the Florida recount, which had called the election for Bush. That was, I think, exactly right. The real Obama debates McCain and wins; Walter Kirn imagines Edwards debating Romney and losing. The only small disappointment, to me, was that it could no longer be a cover story. New York’s next-to-last issue of the year is a wrapup of the year in culture, containing all our critics’ top-ten lists and other great culture coverage. It is both popular and excellent, and it’s always the cover. (Besides, even I had to admit that the Gore story was probably a little too eccentric to be a full-blown cover.) 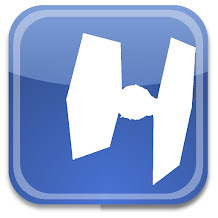 So Gore went inside, and I am pleased to say that it made a modest splash on the Web, which is what brought me here to StarWarsModern. I do have one lingering question: I wondered, for the next few weeks, whether Al Gore himself read the story. We never heard from him, of course, nor did we expect to. But if by some chance he saw it, I hope he enjoyed his alterna-presidency as much as I did. Kurt Andersen's wrap up of an imagined Gore presidency.